Labasa finally stamped its mark on the prestigious S M Singh Memorial Cup held over the Auckland Anniversary weekend at Mangere Centre Park. After 16 years of trying to wrest the trophy, the team triumphed with aplomb and respect that will bode well for the Club in future. 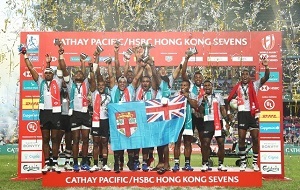 The road to victory was not easy as Labasa disposed of seasoned oppositions and defending champions NZ Ba and NZ Masters who were stacked with former Fiji reps Esala Masi, Shalendra Lal, George La, Poasa Tubuna and Bakalevu Mociemarike. NZ Labasa Lions had the services of former Labasa goalkeeper Shamal Kumar and player Orisi Vunisa, but they could not penetrate the Sydney Tavua defence in full time. 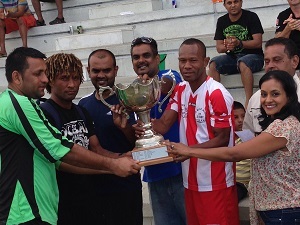 The winner was decided in the dreaded penalty shootout with Shamal Kumar saving two penalty kicks. 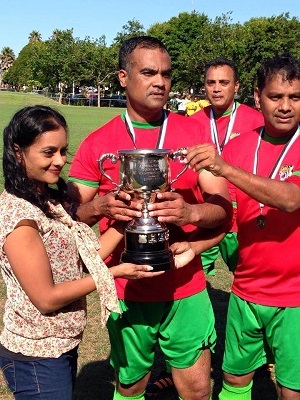 The five-day international event concluded on Monday, January 26, 2015 with the NZ Delta Tigers winning the 6th Billy Singh Memorial Cup in the over 40s division. NZ Masters could not contain the fast-paced Delta Tigers, which saw them conceding two early first half goals. 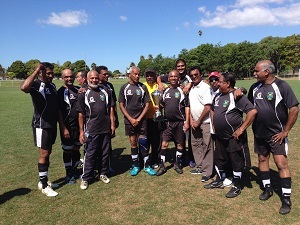 Delta Tigers led 2-0 at the break and NZ Masters failed to capitalise on the few chances they got during the Tournament. The second half saw Delta Tigers come in strongly, only to be denied by the tough NZ Masters goalkeeper but managed to score a third goal before NZ Masters pulled one back. 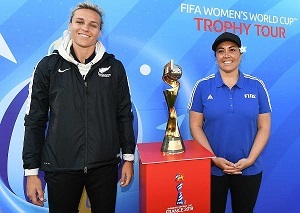 It was a thrilling finale to a great Tournament. As expected, both teams played fast-paced football. 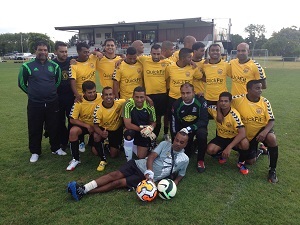 NZ Labasa Lionz had the services of Shamal Kumar in goal and Orisi Vunisa in defense, containing highest goal scorer of the Tournament Munesh Chetty. The Sydney Tavua striker with nine goals to his name looked dangerous in attack but good defense work by Orisi did not allow him to score. Labasa Lionz forwards had numerous chances to put the match beyond reach in full time but could not find the net.